Tuesday Treat from Marked for Magic. This morning, with his concentration on the scrying to come, the glamour had failed. For the first time in two days, she did not appear old, gray-haired, and warty as she stood in the light spilling in from the clean window. This morning she was the sun-kissed, fair fae who had knocked on his door. Not only did she glow, lovely as a dew shimmered lily, but the new gown clung to her lithe body. The wide skirt spread down from her hips in a sweep to the floor. The bodice, pulled skintight by her lacings, outlined her body in detail. Each rounded breast stood ripe like a summer apple, ready for plucking. “I didn’t expect it to look like that, Sparrow.” He rose from the chair, crossed the room in three swift steps, took her hand, and, unable to resist, bowed. The pink blush on her cheek beckoned his finger to stroke over the heat. If he didn’t get her out of here now, no question about it, Lord Farel would wait a long time for his arrival at the castle. Instead of traveling there, he’d spend the morning in the delightful exploration of the sweet, soft curves outlined by the clinging red wool. His mouth grew dry and he couldn’t swallow. Closer now, she smelled fresh, like the woods after rain, and try as he might, he could not dismiss her appeal to his senses. “Yes, Sparrow, you look like a queen. Lady Cassandra will adore you.” He cast about for any other thought but Nin. Facebook http://on.fb.me/18iRC35 And next week blog posts here will be back to normal with Blooming Lovely Monday, Tuesday Treat and Time for Tarot. Today my Marked for Magic Tour visits with my friend Eva LeFoy. Do drop by and enjoy. 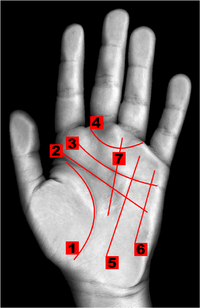 Your taste of palmistry today is all about one of the types of patterns you might find in you finger prints. To see these clearly you will probably have to do a proper print on paper using ink. The loop is the most common type of finger print. It looks, like a wave. A loop shows the individual to have an agreeable, easy-going and adaptable mindset. People with a lot of loops get on well with everyone. If you have a set of them, you are very adaptable to new social situations. A sociable individual you enjoy connecting with others. I’d love to know if you have a set of loops or perhaps just one finger with a loop pattern. It’s not uncommon to have a mixed set of prints. I’ll tell you about some of the others soon. Marked for Magic is at thewholeshebang today. Do drop by and enjoy a spot of palmistry and an excerpt from Marked for Magic. A little palmistry for you. Today I am looking at what are sometimes called affection lines or marriage lines. Some readers refer to them as sexuality lines but I don’t think that’s quite right. These are markers of important life changing connections in my view. You might need a magnifying glass to find these as sometimes they are difficult to spot. Turn your palm so you are looking at the percussion edge. Just below your Mercury finger, the little finger, you will find one or two, maybe three or four horizontal lines. These illustrate the important serious relationships in you life. They usually marriages or partners with whom you will live and share life. If you have one deep clear line you will have a very happy serious relationship with someone, two lines similar but two serious relationships, and so on. If the line is broken it usually means the relationship will end in some way. I love to know more about palms. Take a peek and see if you have affection or marriage lines and it they are right so far in your life. Today Marked for Magic visits the blog and face book page of the talented author Cindy Vazzi. Rascette or bracelet lines are one of the minor lines on the hand which give information about wealth, health, and travel. The rascettes are the rings between the wrist and the palm. Parallel and clearly marked rascettes are said to mean a healthy, wealthy, long and peaceful life. Chain like top rascettes means ultimate happiness after a difficult life. Most people have two racscettes some lucky people have three. It ias said each rascette stands for between 23 to 28 years of life but I have to say I haven’t researched that myself. Take a peek and see how many racettes you have.